Has your inspiration abandoned you? Do you have a writer’s block? We have a solution! If you are in search of a way how to create compelling content that will help you hit the top ranks in no time,you’re in the right place. 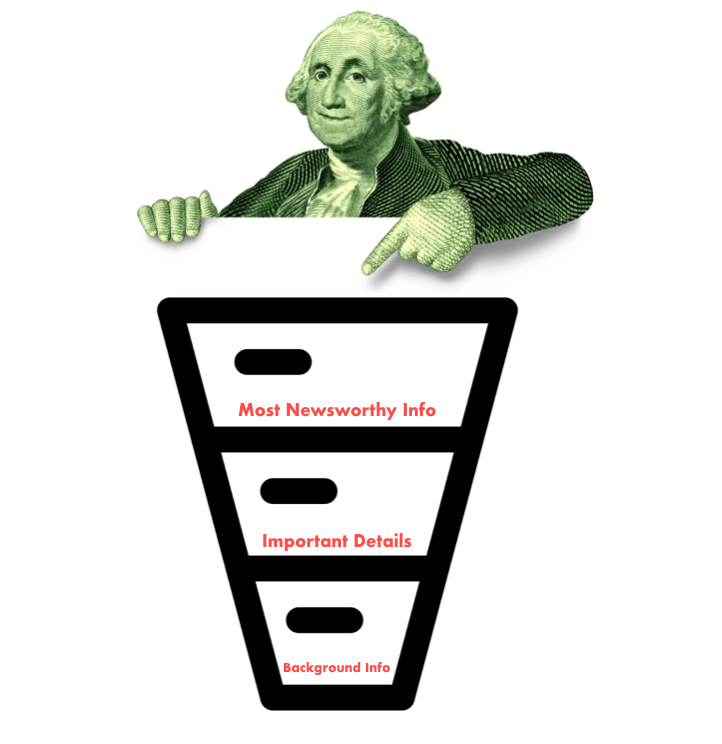 The inverted pyramid method is a well-known method of writing in journalism that was initially developed with one aim – to grab the reader’s attention right from the start. Being one of the most effective methods of writing, this technique can help you write incredible SEO articles, drive more engagement, boost brand awareness and social shares. What is the inverted pyramid writing style? Big ideas come first, and details follow. What makes an inverted pyramid such a powerful technique? What makes people share the content? When you are reading a novel, you are always in suspense what will help next and when the plot will begin to unravel. The writer leads you through every chapter slowly preparing you for the climax. And, this makes perfect sense when writing a novel. However, when writing a newspaper article or an article for a web, you need to get people’s attention quickly. You have to have the compelling headline. You need to make them want to read more. In its core, the Inverted Pyramid Style puts the most intriguing and critical piece of the story at the beginning with the aim both to inform and engage the reader. In that way, your readers don’t have to scroll down to get the main point, or even worse, jump from page to page on websites. What’s in it there for your readers? You will definitely draw in the reader, and what’s more, make him continue reading to find out the background of the story. Once you tickled your readers’ curiosity, you are ready to go into details. Your readers would want to know the background of the story: “How did they get into the store?”, “What was the girl’s reaction?”, “Did they take the money?”, “What happened next?”. Give them what they are yearning for. By providing details, you’ll keep their attention and make them want to read the whole article. To make things even more interesting, keep paragraphs in the same format: put the main points in the initial sentence and then build on that point. This stand-out first sentence is also known as the core sentence. It gives the reader what he or she needs, and he or she can choose whether to read the rest of the article or not. Keep in mind that you should express only one point in each paragraph because it is easier for readers to follow the plot. After pointing out the details, you can move to the context. This includes the root of the problem and the reason why robberies happen so often. You can also touch on the statistics related to crime and criminal behavior in the country and, in that way, trigger speculation and even discussion on that particular issue. This adds value both to the entire article and you as the author of the article. On top of that, it raises interests and engages readers potentially in the discussion. Does a term “block-based content” ring a bell? It should because, recently, this movement has been making an impact on search engines. Google uses the whole chunks of texts – paragraphs to answer questions in search results. By giving the blocks the structured data needed to let search engines know what specific content is in that block, we can increase traffic on our site. Hence, one more reason to write better, compelling and stand-out paragraphs. By structuring your questions and answers by using an inverted Pyramid technique, both your readers and search engines will digest it more easily. In other words, when someone asks a certain question, go straight to the gist of the question and put it at the beginning of your answer. Tell your readers what you know, move on to the details and only then get to the context. Finally, include the sub-questions, especially if the initial question is too broad and should be broken into chunks. This will inevitably trigger the readers’ reaction. Finish the answer with some call to action and, voila, you have written the page which will potentially attract qualified leads and convert. Attention span is a new currency. We are well aware of the fact that readers’ attention span is shrinking each year making a huge impact on the marketing in general. In terms of social media, we are given a very limited ability to grab the reader’s attention. Is it happiness, is it a controversy or sad stories? According to the Jonah Berger, author of the book “Contagious: Why things catch on,” the things that go viral must have an emotional hook. It’s the emotions that will make people want to talk about that particular subject for days or even months. And, what’s the easiest way to provoke the emotion? By writing a compelling headline (a lead), good excerpt (details) and thematic and supporting captions (context) – all the essentials of the Inverted Pyramid technique. If you’re stuck and you feel you’re experiencing some writer’s blocks, it’s because you lack a writing process. There is one process which is used in journalism called, inverted pyramid style. What’s interesting about it is that it inverts the logic of the way a story is told. In short, rather than start from the story details, you start from a hook, which is critical to get the reader involved. This system is quite effective because it aligns both the reader and the search engine crawling the page, thus by making the page also SEO-friendly. After the hook, you keep going with details and context, which makes the readers wanting more! So, the next time you start writing a new piece of content, don’t bury you key information somewhere in the middle of the third paragraph. Put it up front, give your readers what they want, and make them ask for more. It’s a sure way to a great article. Marko Velickovic is a certified and results-oriented SEO specialist with 10 years experience in the SEO domain. He is the founder of Serpline.com and SeoProLab. You can connect with Marko on LinkedIn. Thank you Zara 🙂 It is an incredible process/technique. The credit goes to Marko, which contributed to the blog. Zara, thank you for reading. If you have any questions, do not hesitate to ask. Outstanding post mate! Making compelling headlines is very important. It carries a lot of responsibility.